Dotted Music has recently released their first free ebook, called “10 Truths About ‘Making It’ In Music: From Musicians Who Already Made It“. Several months in the works, this 50+ pages report was written by Dotted Music’s Ben Brown. It is inspired by 10 quotes of successful musicians, including members of OK-Go, Puddle Of Mudd, Anthrax, Dire Straits, as well as Jared Leto and more. These quotes were taken from interviews you might have read on their blog throughout the past year. Don’t believe the hype – the music industry isn’t dead! The digital age is quite simply the best time for music and musicians. Ever. We can’t get enough of new music, there’s never been more of it available and artists are retaking control of themselves. A DIY career in music is possible, but you have to be self-starting, entrepreneurial and creative-as-hell to stand out. This book will give you the tricks and advice you need to get started and help you turn your passion into a viable, sustainable living. “10 Truths” is free to download and to share. It is their gift to artists trying to build their careers in the rapidly changing music industry. 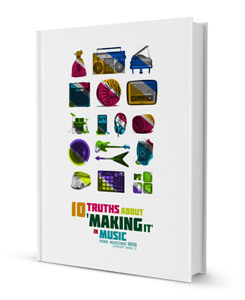 JOIN OUR MAILING LIST AND GET A FREE COPY OF "10 Truths About ‘Making It’ In Music"